Prototype: Class F 140 AC 2 electric locomotive painted and lettered for "AngelTrainsCargo" (ATC), leased to the "Häfen und Güterverkehr, Köln" / "Harbors and Freight Service, Cologne". Built starting in 2005 by Bombardier as a locomotive from the TRAXX locomotive program. Use: freight service. Model: Era VI. The locomotive has a die-cast metal frame. It also has a 21-pin digital connector. The locomotive has a 5-pole skewed armature motor with a flywheel, centrally mounted. 4 axles powered through cardan shafts. Traction tires. The lighting is maintenance-free, warm white LEDs; they will work in conventional operation. The locomotive has detailed roof equipment. The engineer's cabs have interior details, and the front one has a figure of an engineer. The locomotive has NEM coupler pockets with a close coupler mechanism. Long brake hoses are included in a bag. Length over the buffers 217.2 mm / 8-9/16. One-time series in 2010 for the Marklin Exclusiv program. TRAXX from TRIX. Locomotives from the TRAXX type family built by Bombardier are in operation everywhere in Europe today. In 1994, the AEG experimental 12X locomotive appeared, which then underwent testing as road no. 128 001 on the DB. The knowledge gained from this went into the development of the class 145, which was placed into service on the DB starting in 1998 as a freight locomotive with a maximum speed of 140 km/h / 88 mph. Eighty locomotives were built for the DB and additional units for the Swiss Mittelthurgau Railroad, which were used in the end on the SBB as the class Re 481. There are several other class 145 locomotives on privately owned railroads. The class 146.0 for commuter service was derived from the class 145; the most noticeable feature of the former is the train destination sign on the end of the locomotive. The class 146.0 is designed for 160 km/h / 100 mph and also has a time-multiplex push/pull train control system. The real success story began in 2000 however. Bombardier introduced the multiple system version: The class 185 was also designed for the power current systems of neighboring railroads. A total of 400 units of the class 185 are to be purchased. Depending on the country they will be used in, the locomotives are being equipped with the correct train safety systems and with electrical equipment as a package. So, there are locomotives with two or four pantographs and different contact wiper widths as the most noticeable external difference. There are also many class 185.1 locomotives on private railroads. And, there is a class 146.1 160 km/h / 100 mph fast version of this locomotive for commuter service. 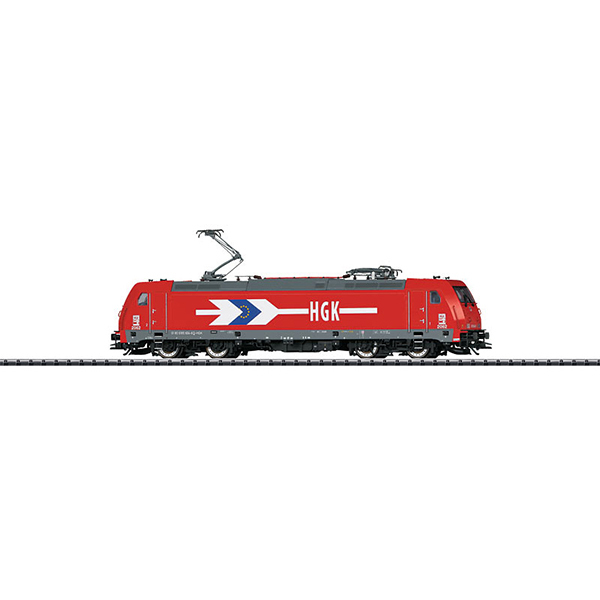 The TRAXX family locomotives delivered starting in 2005 formed the next evolutionary step on European railroads: They were equipped with locomotive bodies with improved ability to withstand crashes; the shape of these locomotive bodies looks more powerful and brawnier at the ends. Other changes have to do with the electrical rectifier layout. Railion is presently putting 200 of these locomotives into service as the class 185.2. There is also a commuter service version of this locomotive for 160 km/h / 100 mph, the class 146.2. These locomotives are currently being used as motive power for the latest bi-level trains in the areas of Stuttgart, Freiburg, and Nurnberg. The new Trix models are modeled from this latest version on the German Railroad, Inc. (DB AG).